OBJECTIVE. The purpose of this study is to examine subcentimeter thyroid nodules to determine their rate of malignancy, the accuracy of various ultrasound features in prediction of malignancy, and the utility of ultrasound-guided biopsy of these nodules. MATERIALS AND METHODS. 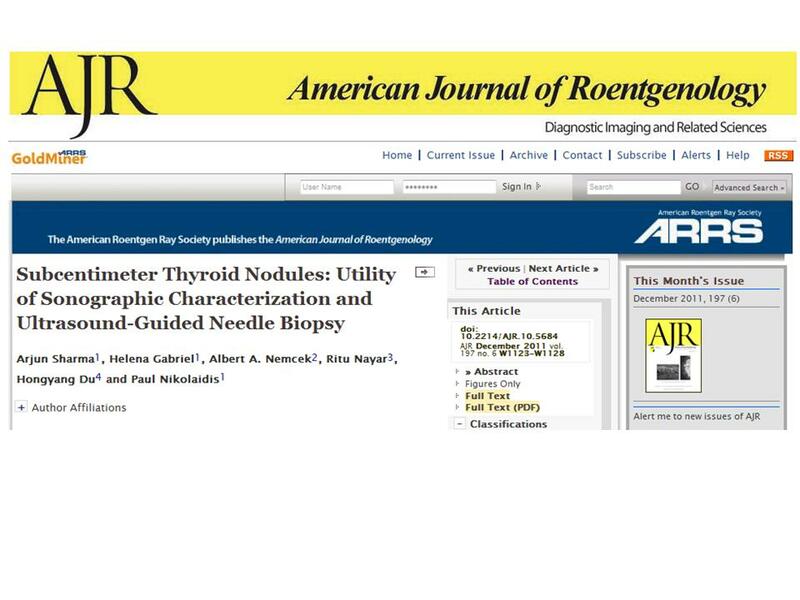 Included in this retrospective study were 104 patients in whom 108 thyroid nodules smaller than 1 cm had been biopsied. Diagnostic ultrasound examinations were reviewed, and nodules were evaluated for the following ultrasound features: internal echogenicity, margins, height-to-width ratio, presence of calcifications, posterior acoustic features, solid-to-cystic ratio, presence of a halo, and color Doppler characteristics. In addition, a subjective assessment of level of suspicion was assigned to each nodule. Each feature was correlated with the pathologic results to determine the accuracy of the feature for predicting malignancy. RESULTS. Adequate cytologic specimens were obtained in 97 of the 108 subcentimeter biopsies (90%) performed. The average size of malignant nodules was significantly smaller than the average size of benign nodules (6.4 ± 2.1 vs 7.7 ± 1.4 mm, p = 0.041). The rate of carcinoma among nodules with a final diagnosis was 19% (16/85). The most accurate features significantly associated with malignancy were posterior acoustic shadowing (87%), many diffuse calcifications (82%), rim calcifications (81%), and taller than wide shape (79%). The subjective level of suspicion correlated well with the presence of malignancy (76%). CONCLUSION. Subcentimeter nodules are significantly associated with the risk of malignancy and can be accurately and safely biopsied with a very high diagnostic rate. Certain ultrasound features can be used to accurately stratify risk of malignancy, although no single feature replaces the clinician’s overall impression.